There are some incredible hikes in Garrotxa – it’d be silly to miss them! Hiking in Garrotxa is a fantastic way to discover this beautiful region. Come to think of it, hiking is a great way of discovering any place. That’s why I regularly go on long distance hikes, and end up walking for a week at times. I find it to be the best way to get close to nature; learn more about the history of a place; meet the local communities and have an overall good time. Set between the Pyrenees and Costa Brava, located in the province of Girona and part of the Girona Pyrenees region, Garrotxa is completely landlocked, and for the most part lies under 600 meters above sea level, though there are peaks that go well over 1500 meters. It is one of the pretties regions of Catalonia. For as pretty as it is, Garrotxa has yet to be discovered by mass international tourism. With its volcanic landscape (there are more than 40 volcanoes in Garrotxa) and lava flows, the gorgeous forests and being right on the Pyrenees, Garrotxa is the perfect place for hiking. Adding to this already great scenario, there are the beautiful small medieval villages and the hidden Romanesque churches, some at the very top of mountains or at the center of the craters of extinguished volcanoes, and only visible to those who make the effort to hike there. I visited a bunch of those hidden churches, explored several of those villages, and walked through many of those forests. Indeed – you guessed it right – I spent 9 days in Garrotxa, 7 of which hiking my way around, following the trails of Itinerannia. I truly enjoyed my time there – though I admit it was hardly enough to fully appreciate all that it has to offer. In case you are still wondering, let me clarify this: if you like nature, hiking and quaint medieval villages as much as I do, you have to visit Garrotxa. For you, I have put together this post, so that you will you have a better idea of what to expect and how to organize your trip around this incredible part of Catalonia, and how to make the most of the hikes in Garrotxa. Before I go on to describe my hiking itinerary, however, I’ll share a bit of background information on Itinerannia, the network of hiking trails in Garrotxa. During my trip to Garrotxa, I mostly followed the hikes in Garrotxa in the Itinerannia network of trails. The network consists of more than 2500 km of paths. The trails recover the old trails found in Garrotxa, L’Alt Empordà and El Ripollès, and connect the towns of the Pyrenees to those of the Mediterranean. The idea with all the trails of Itinerannia is that the hiker can pick and choose whichever ones he wants to walk so as to design its route to move around the region and visit the places he is interested in. Itinerannia trails are marked in yellow, by way of vertical signs at crossroads, which indicate the nearest villages and the walking distance to them (yellow sign with red tip), or the thematic itinerary (yellow sign with green tip); or horizontal signs by way of yellow marks painted on tree trunks or rocks. At times, Itinerannia trails coincide with those of the GR – an abbreviation of Gran Recorregut, which indicates long distance trails usually longer than 50 km and which is an extensive network of trails across Europe. GR trails are usually marked in red and white. Itinerannia has hiking trails of any difficulty level. Some are perfect for family with children looking to spend a day out in the nature; while others are significantly more challenging and for more experienced hikers. What I like the most about Itinerannia trails is that each of them combines a walk in the nature with incredible views and a visit to a place of historical or cultural significance. In other words, they all combine the things I enjoy the most when traveling. Sant Feliu de Pallerols, and more precisely the rectory of Sant Miquel de Pineda, was my starting point to enjoy all the hikes in Garrotxa. The village is at around 45 minutes drive from Girona and Girona airport, and it’s another 10 minutes drive (or a 45 minutes walk) to reach Sant Miquel de Pineda. Sant Feliu is one of the nicest medieval villages in Garrotxa, with beautifully kept bridges on the river Brugent, antique homes, a mill and even Art Nouveau buildings. From there, it’s possible to see the laval flows from the eruption of volcano El Traiter along the Brugent river, and to reach Volcano Sant Marc, which is at just 20 minutes walk from the center. Several itineraries, departing from the center of Sant Feliu, cover the most interesting places to visit in the village and its municipality. San Miquel de Pineda is a lovely Romanesque church, now part of the architectural heritage of Catalonia. Right by it, there is the rector’s house, which has recently been completely restored and turned into a beautiful boutique hotel. Casa Prat is a fabulous country house. Guests can rent the whole place, or just a room, and can use the kitchen. Click here for the latest rates and here for reviews. Aiguabella is a manor house, close to the center of the village. Guests can rent a room or an apartment which also has a kitchen. Click here for the latest rates and here for reviews. La Rectoria is the only place to sleep and eat in Sant Miquel de Pineda. It is a lovely bed and breakfast in what used to be the home of the rectors of the church next door. The lovely host serve scrumptious breakfasts and delicious dinner accompanied by local wine. Click here for the latest rates and here for reviews. Teisa has buses to Sant Feliu de Pallerols from Barcelona (3 times a day) and Girona (6 times a day). If you take the bus from Barcelona, you have to pick the service to Olot via Amer. The bus from Girona leaves at Carrer de Pierre Vilar. Sant Miquel de Pineda is on the Olot – Girona Via Verda route. It can be reached from Sant Feliu on foot or by bike. Another option is to take the Teisa bus from Barcelona or Girona. You have to get off at Sant Miquel de Pineda and from there it is a 10 minutes walk to La Rectoria. The first day on this hiking itinerary in Garrotxa is spent walking from Sant Miquel de Pineda to Joanetes. The trail starts right outside La Rectoria in Sant Miquel de Pineda, and goes through the forest following the Via Verda to Sant’Esteve d’en Bas and Hostalets. The walking time between La Rectoria and Hostalets is about 2 hours. Once in Hostalets, you have to walk through the pretty, tiny village on the main road until you reach the church and have the option of going left or right. Go right, and follow the signs to the old cemetery. From there, follow the G63 trail to Sant Miquel de Falgars until reaching a sign that points to Sant Miquel de Castelló. When you get to Sant Miquel de Castelló, you should follow the red and white signs (the GR2 trail) towards Joanetes. It takes about one hour to get back down from the mountain, and then another half hour to get to the village, depending on where you will be staying for the night. Download the track on Wikiloc here. Overall walking time: depending on your walking speed, around 5.5 hours, without breaks. Lunch break: You will find some restaurants along the way, so there is no need to pack lunch. However, make sure to carry enough water. Hostalets is the perfect spot for a lunch break as it’s right in the middle. The best place to eat there is Ca l’Esteve. It’s a very popular post with the locals, that serves a set menu for a mere €12 euro – you can pick an appetizer, a main course and a desert, and have a drink and coffee included in your meal. The food is very good and the portions are huge! Much like throughout Garrotxa, on the way from Sant Miquel to Joanetes, the sights are nothing short of amazing. The first part of the trail is through the forest, and you will be walking next to some pastural land and by some old country houses that are actually quite impressive to see. You will walk through Sant Esteve d’en Bas, one of the many medieval villages of Garrotxa. The view of the village from a distance is beautiful (and even more so from a hot air balloon!). For as tiny as it is, Els Hostalets d’en Bas is lovely – so much so that it’s been declared a National Historic-Artistic Monument. The nicest sights in the village are the wooden balconies full of colorful flowers on the main street, and the church. The Hermitage of Sant Miquel de Castelló is impressive. The church, which used to be the chapel of the castle of the Viscount of Bas and of which the first mention dates back to the 14th century, is usually closed, so chances are you will only be able to see it from outside. Yet it’s quite a sight, especially because of the incredible location. The view of the Vall d’en Bas from there is simply breathtaking. This is one of the nicest hikes in Garrotxa. The first part of the walk, from Sant Miquel de Pineda to Hostalets, is fairly easy. You will be waking along a well kept and well marked trail, like it usually is in Garrotxa, and by some fields. You will occasionally meet locals walking their dogs, or biking (I even met a whole primary school class that was out for a day trip!). Locals are always available and happy to help with directions and other information. The second part is more challenging, and you will have to pay attention to where you go, especially as chances are you won’t meet anybody along the way. The terrain is not as good as during the first part of the walk, as it can be slippery and muddy. It’s completely uphill on the way to the Hermitage, and downhill on the way to Joanetes. TIP: Make sure to have an early start during the fall and winter months, so that you can reach Sant Miquel de Castelló in full daylight and get a fantastic view of the valley, and still have plenty of time to walk to the village. TIP: On this day, you’ll have to carry your backpack with you, or arrange to have it taken to your hotel in Joanetes. For as small as it is, Joanetes has some good accommodation options. Both the ones I mention below also offer meals. Casa Rural Mas El Ferrés is a basic guest house. Rooms are very large and have nice views of the mountains. All meals are home cooked: food is genuine, portions generous. The owner is truly friendly and kind. Click here for the latest rates and here for reviews. Hotel de la Vall d’en Bas is a beautiful boutique hotel. Rooms are large and comfortable, with a fantastically equipped bathroom. The restaurant serves gourmet food and traditional dishes with a contemporary twist. Click here for the latest rates and here for reviews. Of all the hikes in Garrotxa that I walked, this is by far the hardest. The hike is meant to be a circular one, starting in Joanetes, going all the way up to the Hermitage of Santa Magdalena on Les Agulles mountain, and then walking back down to the village via a different route, through the forest. I was unable to follow the route back and had to take an alternative path to Joanetes, so my instructions will be based on my experience. The trail starts just outside Joanetes and goes all the way up to the Hermitage of Santa Magdalena, one of the nicest in Garrotxa, via the Camí dels Ganxos, via the Puig del Soi (Puig means Mountain in Catalan) and El Barret. Past that, it reaches a footbridge with a railing and the “ganxos” (hooks) that allow you to go up the vertical wall and eventually take you to the Canal Fosca (Dark Channel) from where you can reach a viewpoint of the Vall d’en Bas and, past a wooden fence, the Hermitage of Santa Magdalena del Mont. The overall climbing is no more than 100 meters it is quite challenging, especially if going alone (which I don’t recommend). The way back to Joanetes is via a steep path that follows the G61 trail to Sant Privat d’en Bas. I didn’t take this route, but followed the Puigsacalm Pas dels Burros trail, for what is one of the nicest hikes in Garrotxa, making stops at Puig dels Llops for beautiful views of Garrotxa, and then heading down via the Pas dels Burros, which actually goes around the Puigsacalm and takes to more hooks which however are easier to climb down thanks to the presence of an iron rail. Past the hooks, the trail goes to El Barret and the Puig del Soi again, from where it’s an easy (if only a bit steep) way back down to Joanetes. Overall walking distance: 14.4 km if following the official circular route; 15.5 km on the alternative route I followed. Overall walking time: depending on your walking speed, around 7 to 8 hours, for either routes. Lunch break: There are no coffee shops, restaurants and kiosks along the way to buy food or water, so you will have to pack whatever food and drink you think you’ll need for the day. Make sure to carry at least 2 liters of water. The views of Garrotxa on the Santa Magdalena / Camí dels Ganxos are breathtaking. A big part of the hike goes through a thick forest, and if you walk it in the fall, you’ll have a chance to see the beautiful foliage. The views of the valley from the various panoramic points are stunning, and provide an excellent reward for all the challenging moments, which you’ll have no shortage of. The cherry on the cake is the lovely Hermitage of Santa Magdalena del Mont, which was founded by the monks of Sant Mary of Besalú between 977 and 988. This is one of the nicest hermitages of Garrotxa. At the moment, the church is administered by the municipality of Sant Privat d’en Bas. Officially a medium difficulty hike, this actually is one of the most challenging hikes in Garrotxa, with difficult terrain – uneven, incredibly muddy and slippery after the rain; very steep. The trail isn’t always easy to follow, and it is often necessary to stop and look for the yellow marks which at times are not easily visible. There are parts, like the hooks, that you won’t easily go through without the help of others. I wholeheartedly recommend joining a group and hiring the services of a guide to follow this trail for safety reasons. Read why I think hiking alone is a bad idea. Keep in mind that the timings given by the vertical signs and even on the website of the local tourism boards are significantly underestimated. They suggest an overall walking time of 5 and a half hours, whichever combination of trails you decide to follow, but the actual walking distance is more in the range of 7 to 8 hours, even if you are fit. A local guide I have met told me he regularly walks it and he never takes less than 7 and a half hours. TIP: Give yourself plenty of time to complete the hike, and start walking as early as possible to make sure that you complete it in daylight. TIP: If, despite my recommendations against it, you decide to walk this hike alone, make sure to properly research the hike and the terrain before you go – provided you find information in English other than this post – and to be fully equipped in terms of gear (make sure you take a torch and a power-bank, in case you get stuck in the dark) and of food and drinks. This is one of the most pleasant hikes in Garrotxa. The starting point of the walk on the third day of this hiking itinerary through Garrotxa is the Church of Sant Pere de les Preses, from where, in about an hour and a half, you will reach Olot to hike the two volcanoes (Montsacopa and Montolivet) and where you will be spending the night. The trail to Olot is actually quite easy, on easy terrain. You have to follow the signs to Olot Pocafarina that go behind the municipal pool, and soon you’ll find yourself on the crater of El Racó volcano. Going down from that you’ll reach Pocafarina, and continue walking along the nicest lava flows of Garrotxa and the dry-stone walls made of volcanic rocks, in an area known as El Bosc de Tosca. You’ll enter Olot via the Parc Nou, one of the nicest parks in Garrotxa, and from the city center you’ll easily reach the trail to Volcan Montsacopa. There are two routes that both reach the crater, and you can walk one up and the other back down. I suggest taking the trail that goes through the old city to the crater (it takes around 20 minutes) and back down by the cemetery (another 20 minutes). From there, it is an easy walk to the church of Sant Pere Martir, which you’ll recognize thanks to the saint’s head carved into the façade. Behind the church, there is a nice square and the trail to Volcan Montolivet begins. From Montolivet, you’ll come back down and end up walking by the river, through an area known as El Tossols and to the Font de la Gruta. From there, you can easily reach the city center. Download the tracks on Wikiloc: Les Preses to Olot and Montsacopa Montolivet Circular Route. The beautiful views along the way make this one of the nicest hikes in Garrotxa. Walking through the shadowy forest that now covers the crater of El Racó is incredibly pleasant. You’ll get to visit Parc Nou, one of the nicest parks in Garrotxa, and walk through the center of Olot, where I recommend spending at least a full day to explore its museums and admire the lovely buildings. Entering Olot after walking on Montolivet, you’ll enjoy the pleasant sound of the river flowing and the sight of old buildings right by it, including a beautiful bridge. Yet, the highlight of the day is the lovely views of Olot you’ll get from Volcan Montsacopa crater, as well as those you’ll get from the viewpoint of Plaça de Sant Pere Martir. These qualify as some of the best views of Garrotxa. The combination of various trails make this one of the longest hikes in Garrotxa on the Itinerannia network, but it’s actually easy, especially compared to the previous day’s walk to Santa Magdalena hermitage, which on the other hand is one of the most challenging hikes in Garrotxa. The only minor challenge will be walking up the craters of the volcanoes, but it’s completely doable. The trail is mostly easy to follow, with clear vertical signs. The only place where the directions get a bit confusing and you may want to use your GPS or consult Wikiloc or other walking apps is on top of Volcan Montolivet – the way to get back to town isn’t marked as well as the rest. Much like in the rest of Garrotxa, the terrain is generally good, though it can get quite muddy in the forest after the rain. TIP: As the starting point is at quite a distance from Joanetes, you need to arrange transportation to get to Sant Pere de les Preses. Ask your hotel to do this for you. TIP: Unless you arrange to have your backpack taken to your hotel in Olot, you’ll have to walk with it. Once you get to Olot, however, you can make a quick stop at your hotel to drop the backpack before hiking Montsacopa and Montolivet. Olot has a really good selection of hotels and some of the best restaurants in Garrotxa. Hotel La Perla has large, clean and comfortable rooms. It serves meals. Click here for the latest rates and here for reviews. Hotel Riu Fluvia has a great location near the city center. Click here for the latest rates and here for reviews. Hotel Borrell has plain but clean rooms and it’s in the city center. Click here for the latest rates and here for reviews. La Quinta Justa, in a gorgeous building in the center of Olot, adheres to the Volcanic Cuisine movement. Food is delicious, with a regular menu, daily specials and even daily menus. It’s better to make reservations at weekends. La Deu is actually a bit outside Olot. The food is local – make sure to try olot potatoes, one of the most famous dishes of Garrotxa. The portions are huge. La Cuina del Mercat is a lovely small restaurant in the center of Olot, next to the covered market. Food is good, service friendly. It’s a popular place with the locals. Among the nicest hikes in Garrotxa, there are those in La Garrotxa Volcanic Zone Natural Park. The park has 40 volcanic cones and more than 20 lava flows. I visited on my way from Olot to Santa Pau, one of the nicest medieval villages of Garrotxa. The park, which is actually mostly private land, has a good number of walking routes, many of them joining those of Itinerannia. Most of them are of medium difficulty and some quite easy and suitable for families with children. You can mix and match several trails in just one visit, and get to see a good portion of the park this way. I followed a circular route that started at Can Serra, one of the two parking lots that allow access to the park, and took me to the Fageda d’en Jorda, Santa Margarida Volcano and Croscat Volcano, and afforded me views of Puig de la Costa Volcano too. You can even start in the Santa Margarida area. Lunch break: There are a couple of restaurants in La Garrotxa Volcanic Zone Natural Park where you can eat lunch. They are called Restaurant de Santa Margarida and Restaurant Masnou. My advice, however, is to pack some lunch – sandwiches, fruits, snacks – and plenty of water to make the most of the park. There’s a couple of rest areas with bathrooms, fountains and tables and benches that are ideal for lunch. The sights in La Garrotxa Volcanic Zone Natural Park are splendid throughout. Among the places visited on this hike, there is the Fageda d’en Jorda, which sits on the lava flows of the Volcano Croscat. This is a beautiful beech forest with several volcanic hummocks (tossols) that originate from the volcano. It’s a gorgeous forest to walk through, especially in the fall months with the beautiful foliage colors. At the center of the Fageda d’en Jorda there is a nice dairy factory where you can stop by for a quick visit and to buy some organic yogurt and other dairies. It’s a favorite stop for families with children. The trail also takes to Santa Margarida volcano, a volcano which had several eruptive phases of both the strombolian and the freatomagmatic kind. The highlight of Santa Margarida volcano was walking all the way down to the crater, at the center of which there is a lovely Romanesque church – Santa Margarida de Sacot. The church, which to me is the most special of Garrotxa, was destroyed during the earthquakes of 1427-1428 and finally rebuilt in 1865. It’s only open for special functions. 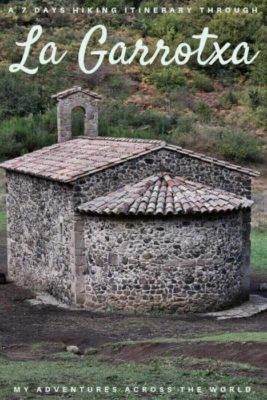 Another lovely church in La Garrotxa Volcanic Zone Natural Park is that of Sant Miquel de Sacot, a well preserved Romanesque Church that was enlarged in the 18th century in a more neoclassical style. One of the most interesting sights is that of Croscat volcano, a strombolian volcano that reaches an elevation of 160 meters above sea level and that, according to researches, is the youngest one of La Garrotxa Volcanic Zone Natural Park. For a long time, one of the sides of Croscat has been used as a quarry to extract volcanic material. Extractions have stopped now, and the massive cut on its side can be seen clearly. This is a pleasant walking day, with easy to follow trails (trails in La Garrotxa Volcanic Zone Natural Park are signaled by way of vertical signs, which are cream colored with a purple tip) and good hiking terrain. You will mostly be walking through the forest and in the shade. TIP: You will need to arrange transportation to one of the car parks that mark the entrance to the park. Teisa has buses that go from the center of Olot to both Can Serra and Santa Margarida parking lots, and from there to Santa Pau. TIP: You can download hiking itineraries for La Garrotxa Volcanic Zone Natural Park on the website of the tourism board of Garrotxa, though keep in mind that information is only available in Catalan. This is the one I followed. All the trails around the park are suitable for mountain bikes too – but keep in mind that you won’t be able to bike through certain areas. You can also visit La Garrotxa Volcanic Zone Natural Park via guided day tours that depart from Barcelona or Girona. Besalú and medieval towns small group tour from Barcelona stops in Santa Pau, Besalù and Castellfollit de la Roca, and it drives through the Volcanic Park. La Garrotxa Volcanic Zone Natural Park and Besalù departs from Barcelona. The tour includes a hike to Volcano Santa Margarida and the Fageda d’en Jorda, a traditional lunch and stops in Besalù and Castellfollit de la Roca. Volcanic Garrotxa day trip from Girona goes to La Garrotxa Volcanic Zone Natural Park, with stops in Santa Pau and Banyoles. Santa Pau is one of the smallest medieval villages of Garrotxa, and the accommodation and restaurant options are actually quite limited. Pensio Hostal Can Mencio is run by a lovely local family. The rooms are basic, yet clean and comfortable. Those on the top floor have incredible views of the church and the main square. Click here for the latest rates and here for reviews. Hotel Cal Sastre is a nice boutique hotel in the main square of Santa Pau, with beautiful stylish room and a fabulous bathroom. Click here for the latest rates and here for reviews. With regards to restaurants, keep in mind that most are closed on Sunday or Monday night, so unless you have a car and can go to Olot or other villages nearby, you may be better off grabbing some food from the local supermarket (which closes at 8:00 pm). Cal Fesol is a nice restaurants that serves local specialties such as the famous white beans of Santa Pau. Cal Sastre serves dishes of the culinary tradition of Garrotxa in a gorgeous setting. It’s in the main square. Santa Pau is the starting point for some of the nicest hikes in Garrotxa. The Ruta dels Gorgs and Ruta de les Fonts leave right from the center of the village, and take to some lovely natural pools which provide a refreshing break from the heat in the summer months. Both trails are circular routes that start and end in Santa Pau. Ruta dels Gorgs, which is the one I followed, goes to some of the nicest and most scenic spots in Garrotxa. Not many people follow this trail during the week (I literally met only two!) so it’s perfect if you need some peace and quiet. Overall walking time: no more than 3 hours, including various stops. Lunch break: This is a rather short hike, but you may want to spend a little extra time relaxing at the natural pools. If that’s the case, make sure to bring water and some food with you. You’ll find a basic coffee shop at a camping site in Cal Paxtet (no more than a few houses!). Alternatively, you can walk back to the village and have lunch in one of the restaurants there. Among the natural pools you’ll be able to enjoy there are the Gorg de Caga Rates and the Gorg Blau. Gorg de Can Cutilla is right by the camping site of Cal Patxet. On the way back to Santa Pau, the Santuari dels Arcs is a lovely sight. This small countryside church, whose origins are still uncertain (some sources date it to 496 AC, others to the 9th century), is actually one of the prettiest of Garrotxa. Santa Pau remains the highlight of the day. One of the nicest medieval villages of Garrotxa, it was built around a Baron’s castle from the 13th century. Unfortunately the castle can’t be visited, but a walk around the medieval center at the end of the hike will show all the prettiest buildings, and lead to the porticoed square where the gothic church of Santa Maria is located. TIP: If you want a great view of the old center of Santa Pau, head to the terrace right next to a coffee shop called Can Pauet. The trail is easy to follow for the most part, and the walk is pleasant. The terrain is mostly good, but keep in mind that you have to cross the river in a few places and the stones can get slippery. Beware that the trail does get confusing once you get close to the camping site of Cal Patxet – that’s where the signs stops and you’ll need a good GPS and a bit of patience to make your way to the last pool. TIP: As this is a short hike that you can easily do in a couple of hours, you may want to add some other activities to your day. I wholeheartedly recommend going on a sunrise hot air balloon tour with Vol del Coloms for incredible views of the Volcanic Region of Garrotxa. It’s pricey, but worth every penny, and you’ll enjoy a scrumptious brunch at the end of the flight which will keep you energized until dinner time. The starting point of this trail, one of the shortest hikes in Garrotxa, is the church of Santa Margarida de Bianya. It is a lovely short walk that goes through a beautiful forest, and around some of the prettiest countryside in Garrotxa. The trail starts right behind the church, and soon enters an ancient oak forest to then reach a lovely manor house and soon another. It doesn’t take long to reach the main road again, and after a turn walk along more farms to reach the church of Santa Margarida de Bianya again. Lunch break: For this short hike, all you’ll need is enough water. For as short as it is, this is one of the prettiest hikes in Garrotxa. The views of the Pyrenees from the hermitage of Santa Margarida are gorgeous. The walk goes through one of the oldest forests of Garrotxa, to then reach a working manor house that is blissfully isolated, and where the in house very sweet dogs and cats welcome (and occasionally follow!) any passersby. The church of Santa Margarida, where the trail starts, looks even better from a distance. You’ll get to fully appreciate this once you make your way back up the hill where it is located. It dates back to the 10th century, though it was first documented in the 12th. The rectory next to it has been turned into a beautiful boutique hotel, which is the perfect place to spend the night. Hiking in Garrotxa, you come across some nice farms where the in house cats and dogs will welcome you! This is a nice, short and easy trail on beautiful terrain and for the most part in the pleasant shade of the forest. There aren’t many signs along the way, but you can ask the hotel for a map, which is fairly easy to follow, or download the track on Wikiloc. TIP: As this trail and that of the Ruta dels Gorgs are quite short, you may want to combine them and do them in just one day (including the balloon ride, if you want). Alternatively, once you are done with the hike you can either head to Hostalnou, which is one of the many lovely villages in Garrotxa, and is only 15 minutes walk from Santa Margarida de Bianya, and to Vall de Bianya. TIP: There is no direct connecting Santa Pau with Hostalnou de la Vall de Bianya. You will have to take a bus to Olot, and then another one to Vall de Bianya, making sure to ask the driver to drop you off at Hostalnou. You can find the bus timetable on the website of Teisa. Alternatively, you can ask your hotel to arrange a pick up. Hotel Mas La Ferreria is located right by the church of Santa Margarida de Bianya. It’s a fabulous boutique hotel with incredibly stylish and comfortable rooms, with views of the Pyrenees. Meals are served too. Click here for the latest rates and here for reviews. Mas Prat is the best self catering place. Apartments are stylish, cozy and comfortable. Click here for the latest rates and here for reviews. On the final day of this hiking itinerary through Garrotxa, you’ll be walking from El Torn, a small village of houses built around the church of Sant Andreu del Torn, to Besalú, the most famous village in Garrotxa. On this day, the Itinerannia trail you’ll be following coincides with that of the GR2, so you’ll be seeing both the yellow marks of Itinerannia that you can find throughout Garrotxa, and the white and red ones of the GR trails. For little more than 2 km the trail goes along the river El Ser. It then reaches the 10th century church of Sant Fruitós d’Ossinyà. From there, the trail follows a dirt road through the forest and then reaches the Urbanització Comtal – nothing more than a few houses and goes all the way down to Besalú. Lunch break: There are plenty of lovely restaurants where you can have lunch in Besalú. Castell de Besalù is a great one. For the purpose of the hike, make sure to take plenty of water and some snacks. This is one of the prettiest hikes in Garrotxa, thanks to the sights. The prettiest throughout the hike is the church of Sant Fruitós d’Ossinyà – yet another Romanesque style church of Garrotxa. This dates back to the 10th century, and like most of the Romanesque church remains completely isolated in the countryside. In this specific case, there is a farm at the back, so chances are you may meet someone who’s working in the farm and his animals – I saw the pretty donkeys and was accompanied by their friendly dog for a while, until I summoned her to walk back home. The highlight is quite obviously Besalú, considered the prettiest medieval village in Garrotxa. You’ll enter the village from the parking lot right outside the visitors’ center, from where you can cross the beautiful bridge that made the village famous. I also recommend walking down the stairs to get a view of the bridge from below, and one of the village from the bank of the river. This is a pleasant, relaxing hike whereby you’ll be walking through the forest pretty much until you can see Besalú from a distance. The terrain is good, with no major difficulties, and the trail well signaled and easy to follow. TIP: There is no public transportation between Hostalnou and El Torn, so you’ll have to arrange a private transfer to the starting point of the hike. It takes about 30 minutes by car. As one of the most visited villages of Garrotxa, Besalú has some excellent accommodation and dining options. Casa Marcial is a fabulous boutique hotel with views of the bridge and a lovely garden and pool. Click here for the latest rates and here for reviews. Cal Fuster is a stylish apartment, perfect if you prefer self catering. Click here for the latest rates and here for reviews. Hotel 3 Arcs is a nice small hotel in the center of Besalú. Click here for the latest rates and here for reviews. If you are looking for a real treat, Castell de Besalú is the best dining option in the village. Pont Vell serves dishes prepared with local ingredients in a beautiful environment. Finally, Can Quei is another lovely restaurant serving traditional dishes of Garrotxa. Getting from Besalú to Girona or Barcelona by public transportation is actually quite easy. Direct buses from Besalú to Girona leave roughly every 45 minutes. There are 4 direct buses per day to Barcelona. The best piece of advice I can give you if you plan to spend some time hiking in Garrotxa is to give yourself enough time in the region. In order to complete all the hikes mentioned in this post, I actually spent 10 days in Garrotxa – I often had to reschedule the hike I had planned to do due to bad weather. Chances are that, if you are super lucky with the weather, you can then use the extra time available to see and do other things around Garrotxa, or even go to Girona. I suggest you join a group for the most challenging hikes – specifically, the Camí dels Ganxos. It’s a long, challenging trail and you’ll be better off with the company of others, who’ll encourage you (as well as help you) to overcome the most difficult parts. A guide will also help making sure you stay on the path. Make sure you always wear good hiking boots with ankle support – some parts will be rocky, others muddy, and you’ll thank your shoes for supporting you! Other gear you will need is: a water bottle, a headlamp or torch, a power-bank. Last, but definitely not least, do get a good map of all the trails you want to follow – local tourism offices should be able to provide them, and sometimes even hotels have them available. Even better try to download the tracks and upload them on ViewRanger or Wikiloc. This app literally saved me a bunch of times when I thought I was lost; it works offline which is perfect if you are in a place where there is no reception; and it’s very easy to use. Garrotxa is well connected to Europe and the rest of the world thanks to two airports. While Barcelona El Prat is the second biggest airport in the country, connected by way of regular and budget airlines, Girona is mainly served by budget airlines. From Barcelona or Girona, you can make your way to Garrotxa by car (either a rental or a private transfer) or public transportation. Teisa has buses that go from either Barcelona and Girona to Olot and other villages in Garrotxa. There are no trains to any of the villages and small cities of Garrotxa. Autumn and spring are the best seasons for hiking in Garrotxa, especially as the days are longer (so you’ll have more light and time to spend walking) and there is less people around. I went hiking in Garrotxa in mid October, and had alternate weather conditions, with beautiful sunny and mild days and others when it literally poured. TIP: Regardless of when you decide to go hiking in Garrotxa, make sure to carry some rain gear and water proof hiking boots, and this part of the country gets quite a bit of rain throughout the year. I have scouted the web for hiking tours of Garrotxa but very few companies offer them. This guide should provide enough information to organize your trip, but should you still prefer to join a guided tour, you may have to opt for a cycling one. Here’s a selection of what’s available. A good local company you can contact to help you plan your trip is Trescàlia, which is based in Olot. I always recommend getting a good travel insurance, even more so if you are planning to go hiking! You can get a reliable travel insurance here. Read why I never travel without travel insurance. You can find more information on Garrotxa on the website of the local tourism board. Cities and villages usually have their website, but the information is often not up to date and at times it is only available in Catalan and Spanish. Have you been on any of the hikes in Garrotxa, or do you plan to? Feel free to leave a comment with your questions!